Ringgit Malaysia (RM) has been down for weeks. 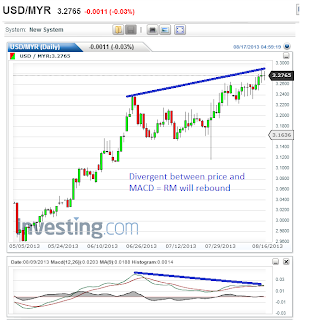 Based on the Divergent between RM & MACD, there is high chance that Ringgit Malaysia would rebound. A rebound in RM would put pressure to CPO. I locked the profit for the final contract at 2339 with a gain of 50 points. I guess it is good enough. I closed 1 contract at 2301 with a little gain of 12 points (2 points deducted for commission). Well, I have no strong reason to exit, the only reason could be the changing month on 15th. I longed CPO Oct 2013 Future Contract at 2287 for 2 contracts. Wow! Quite a high price. The Daily Chart of CPO broke the low (support) of 2217 registered on 13 Dec 2012. This would make it bearish market ahead if we based on support-resistant technique. HOWEVER, further examine the Weekly Chart, we would realize that CPO could be strong. 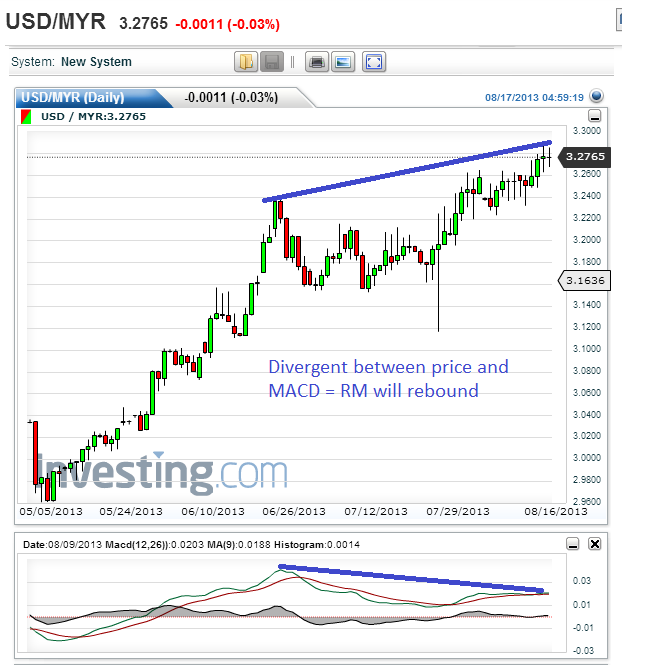 The MACD of Weekly Chart has been moving upwards creating a divergent between the price and MACD. It means that we have to be very careful on the short side.